Be sure to do your research online, with trusted friends and golf retailers before making your decision. Whether they are slicing, hooking, shanking or hacking, people tend to put more blame on their clubs than is due. 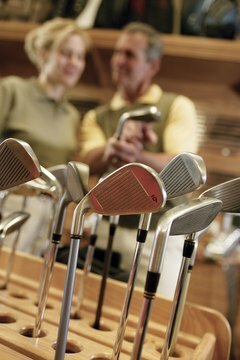 Should you be one of those who likes to blame the tools and not the carpenter, or should you just be in need of a new set of clubs, there are certain things to look for when making your next club purchase. Understanding the basic guidelines for selecting new clubs will help you pick the set that's right for you and your game. Determine your skill level. This is the first vital step and will help you with a number of steps here after, including deciding how many clubs you should have in your bag, type of shaft and the best type of irons. Golfers fall into three general categories: beginner, for those who have played a handful of times; intermediate, for those who consistently shoot between 80 and 95; and advanced, for those who break 80 on a regular basis and have a single-digit handicap. Choose the number of clubs you will want in your bag. The closer you are to being a beginner, the fewer clubs you'll need. Most beginners can handle a basic package of driver, 3- and 5-woods, 3-, 5-, 7- and 9-irons and a putter. Because a beginner's game isn't as refined as those of intermediate or advanced players, you don't necessarily need a full set of clubs. Decide on your shaft flex. Shafts generally are made of stainless steel, graphite or titanium. "Flex" refers to the ability of a golf-club shaft to bend as forces are applied to it during the swing. Understanding your swing speed is key to determining how much flex your shaft should have. There are five ratings for shaft flex: extra stiff, stiff, regular, seniors and ladies. The general guideline for choosing a shaft is the longer you hit your drives, the stiffer the shaft you require. Visit your local golf shop to have your swing speed analyzed. Choose your shaft length. Shaft length is measured from the top of the grip to the sole of the clubhead. The length of the shaft will effect the distance of your shot, accuracy and even your swing plane. Longer-shafted clubs will change the arc of your swing. If you have a smooth, consistent swing, you might consider going with a longer shaft because the change in arc will add to the clubhead speed at impact and add distance to your shots. If, however, you struggle to maintain a consistent swing, using a longer shaft likely will only add to your troubles, making it more difficult to square your clubhead at impact. Have a golf pro analyze your swing to help determine what shaft length you require. Choose the clubhead for your irons. Irons come in two basic types: forged and cast. If you are a beginning to intermediate player, you may want to consider using cast irons because the clubfaces offer a larger "sweet spot," decreasing your chances of mishitting a ball.